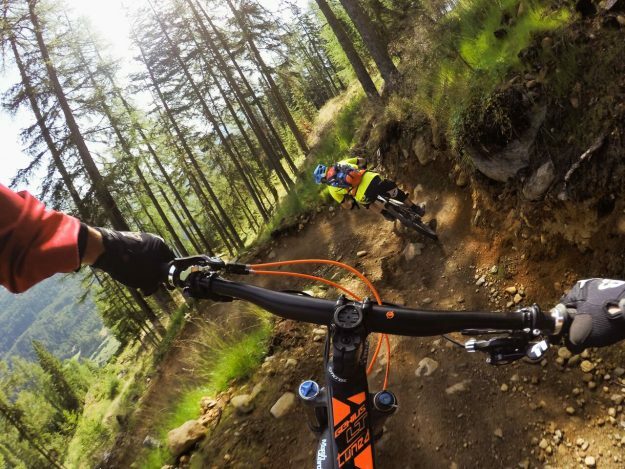 Enduro mountain bike racing has been added to the GoPro Mountain Games calendar of events (photo courtesy of GoPro Mountain Games). The GoPro Mountain Games have grown by leaps and bounds in the past 15 years since the event first electrified the world of mountain sports, music and lifestyle in 2002 when 500 athletes and 12,000 spectators took part. The 2016 GoPro Mountain Games June 9-12 is expected to welcome more than 3,000 athletes and 62,000 spectators. Now, for the first time in its history, the GoPro Mountain Games will offer the GoPro MTN Enduro event in nearby Eagle, Colorado. The enduro mountain bike race is part of the four-day mountain celebration packed with more than 25 different competitions across 12 disciplines, including cross country mountain biking, trail running, half marathon, kayaking, SUP, rafting, road biking, disc golf, slacklining, fly fishing, DockDogs and photography. The event also features music, films, product demos, kid’s activities, and more. “Vail Village is the epicenter of the GoPro Mountain Games and that will never change. With the popularity of the event, the GoPro Mountain Games has now grown to a level where it makes sense that we explore intelligent growth and utilize some incredible terrain and tracks available throughout other areas in Eagle County,” said Mike Imhof of the Vail Valley Foundation, which owns and organizes the annual event. Enduro events are a combined test of endurance and downhill riding skills. When it gets under way Friday, June 10, the GoPro MTN Enduro will send riders through several stages, or transfers, where they must manage untimed uphill segments as well as timed downhill segments. This year’s race is a first foray into the world of enduro racing, which organizers hope will expand into a multi-day event in coming years. In addition to the enduro in Eagle, the GoPro Mountain Games will also be expanding the event footprint within Vail, hosting activities, demos and competitions based out of Lionshead at the base of Vail Mountain directly adjacent to the Vail Village. The GoPro Mountains of Music series also expands this year. Along with live concerts Thursday and Friday at Check Point Charlie, with J. Roddy and the Business, Katchafire, and Tracksuit Wedding, the 2016 GoPro Mountain Games will also feature a concert from Stephen Marley at the Gerald R. Ford Amphitheater, with opening act BONFIRE dub. The music is complimented by the ever-growing Outdoor Reels film series that plays throughout the GoPro Mountain Games. The 2016 GoPro Mountain Games will also feature a new yoga component, with ‘Yoga Girl’ Rachel Brathen on Friday and Saturday June 10-11. For runners, a new Superfeet Après 5K kicks off Friday afternoon. On Saturday, a revamped Mountain Mud Run will complement the Superfeet Trail 10-Kish run, and the EverBank Vail Pass Kicker Half Marathon, over the weekend. Go to the GoPro Mountain Games website for more information and to register.